In honor of Worship Tools Day, I am going to share all of my favorite kitchen tools with you. You have seen most of them many times in the past, but you may not know what they were or why I can’t live without them. I have picked out the tools and gadgets that I use on a daily basis, or almost daily basis. 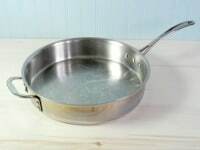 Post contains affiliate links that could make me a few dollars if you click on them, but will not cost you anything to look at the items…..
Baking Sheets – I have 3 of these pans and use them constantly. Roasting vegetables, baking breads/rolls, cookies, the possibilities are endless. I have shown it with the Silpat Mats, because these are the greatest inventions since white bread! I also have 3 Air Bake cookie sheets that I use when sticking will not be a problem (I forgot to take a photo of them). 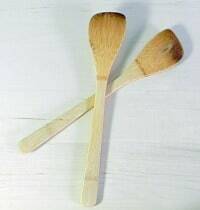 Bamboo Spatulas – These are a must when making stir fry! They are also perfect for breaking up ground meat. These are almost 20 years old and still going strong. Bench Knife – I use it to cut a ball of dough into smaller equal portions. Then I use it to scrape the flour off the marble board when I am done rolling out the dough! Calphalon Bread Knife – Perfect for slicing homemade bread and tomatoes. KitchenAid Can Opener – Not only does it match my kitchen, it is the easiest can open to use that I have found. Kyocera Grater – A must have for grating fresh ginger and whole nutmeg! Just don’t use anything hard to scrape the contents out, you will break off the little teeth…but it still works! Chicago Cutlery Chef Knife – Perfect size and easy to sharpen. Joseph Joseph Colander – This colander is awesome! The handle you see on the left, holds it in place on the center divider in your sink. Just set it in place, fill it, and the water drains away without having to hold it. Yes, it has feet on the bottom as well. The plastic boards on the left, are used for cutting raw meat…only raw meat. Then stick them in the dishwasher to clean them. The Epicurean in the center is perfect for cutting juicy cooked meats. The groove keeps all of the juices on the board, and not on your floor. The bamboo boards (I have several sizes) are perfect for cutting up vegetables, mincing garlic, whatever. Just remember to oil them every once in a while to keep them looking new. 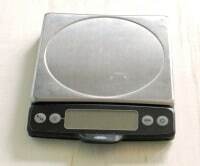 Digital Scale – A must have to weighing dough. Yes some people weight their flour and sugar, but I’m old school and like my measuring cups. 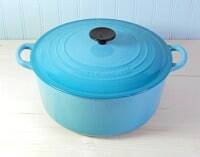 Le Creuset Dutch Oven – Love, love, love this Dutch oven. I had a cheap one from Target (sorry Giada), but it started to rust and the enamel on the bottom was cracking. Plus, it was too small for a large roast. I finally broke down and bought this gorgeous Carribean Blue baby and I absolutely love it!!! Joseph Joseph Garlic Rocker – Just peel your garlic, push the garlic rocker back and forth a few times, and you have minced garlic! Ingenious!!! It’s also really easy to clean. KitchenAid Hand Mixer – This is the mixer that I won, and not a moment too soon. I have an identical green one that stopped working. The crazy thing is, the crystal blue mixer is made in the USA. The green one is made in China. Do not understand. Try and find one made in the USA if possible. I had problems with the green one pretty much since I bought it. It made weird clunking noises when in use, then burned up while I was mixing cookie filling! Kuhn Rikon Kitchen Shears – Cuts herbs and plastic bags quite nicely. They also come completely apart for easy cleaning. Stainless Steel Measuring Cups – Perfect shape, easy to hold, easy to scrape the top even. I just love these! They replaced my flimsy plastic ones. 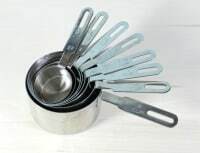 Stainless Steel Measuring Spoons – Nice thin design to fit inside spice jars! Come in all the necessary sizes. 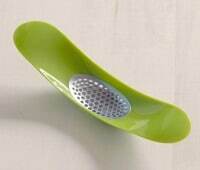 Microplane – Perfect to zest limes and lemons. Finely grated Parmesan cheese, even chocolate! Mini Wire Whisk – This is a Pampered Chef product that I absolutely love! I use it to make the glaze for my cocktail cakes, stirring a roux for gravy, any task that a balloon whisk is too big for. 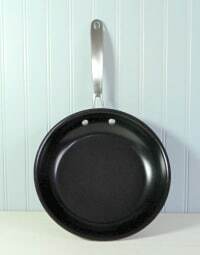 Non-stick Skillets – 8″ for omelets, 10″ for sauteing vegetables, 12″ for juicy hamburgers. Perfect anytime you don’t want your food to stick. Silicone Brush – I use this cute little one for small items…egg wash, melted butter on burger buns. 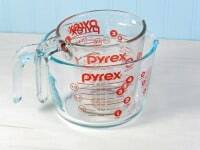 Pyrex Glass Measuring Cups Set – These are awesome for measuring liquids…easy to read. I also had some Anchor Hocking cups, but the lettering rubbed off! These are vintage and I love them. Wood Rolling Pin – This is awesome because it is so long, it doesn’t leave marks. It is easy to control the pressure because it is all one piece. 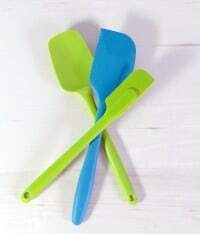 Rubber Spoonula and Spatulas – Won’t melt, pretty colors, lot of shapes and sizes. 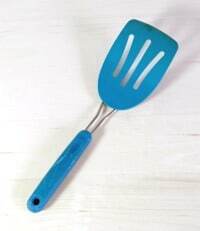 KitchenAid Plastic Spatula – A must with non stick pans, but strong enough to work in any situation. Calphalon Saucepans – These are part of a set. I have multiple sizes that are perfect for cooking rice, sauces, steaming vegetables. They have glass lids so you can see the contents without having to remove the lid! Calphalon 5 quart Saute Pan – I use this for just about everything! I am sure you have seen it numerous times already. 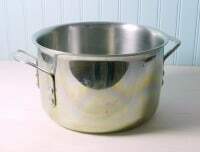 Calphalon 6 quart Stock Pot – This is what I boil noodles, potatoes, and eggs in. Rubber Tipped Tongs – Gotta have tongs! Salads, noodles, anything that needs to be picked up. Vintage Pyrex Mixing Bowl – I grew up using this bowl…then it left when I did! I found several smaller sized bowls on ebay, so now I have a complete set. I also bought and extra one, just in case mine were to ever break. 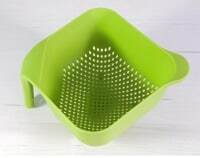 Spider Strainer – I use it to remove items from hot water. I think it came as part of a set with my wok, I love the silly thing. Wire Balloon Whisk – This is my go to whisk for baking. It is strong, the wires don’t bend, and it has a nice handle. What’s your favorite kitchen tool/gadget? Thank you for the advice to find an American made Kitchen Aid hand mixer. I gave my KA stand mixer to my daughter & bought, what else, a KA hand mixer. I was so disappointed. One of the beaters broke within a few months & we put up with the broken “spoke” for another few months. My husband started to look on line for a place to buy a replacement beater, ordered it & kept getting messages that they were out of stock. We finally gave up & bought another stand mixer, a Viking. We are happy with it, but for what we use it for, it is over kill. Gotta have my pyrex cups, bowls and casserole dishes. My microplane is used almost daily, and I likewise love my spider. I’m hoping to get some silpats and a good stand mixer soon.